Listening to someone else’s mix tapes is a huge breach of trust. But KitKat was dead . . . and curiosity got the better of me. When a mix tape destined for her friend KitKat accidentally arrives in Jett Bennett’s mailbox, Jett doesn’t think twice about it—even in the age of iTunes and Spotify, the hipster residents of the Barter Street district of Brooklyn are in a constant competition to see who can be the most retro. But when Jett finds KitKat dead on her own kitchen floor, she suspects the tape might be more than just a quirky collection of lovelorn ballads. And when KitKat’s boyfriend, Bronco, is arrested for her murder, Jett and her best friend, Sid, set out on an epic urban quest through strip joints and record stores, vegan bakeries and basement nightclubs, to discover who the real killer is. However, the further Jett digs into KitKat’s past, the more she discovers about her own left-behind love life—and the mysterious man whose song she still clings to. . . .
Libby Cudmore worked at video stores, bookstores, and temp agencies before settling down in upstate New York to write. Her short stories have appeared in PANK, The Stoneslide Corrective, The Big Click, and Big Lucks. 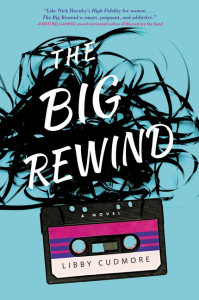 The Big Rewind is her first novel. I read this book the second it arrived on my kindle a few weeks ago, because I was so intrigued by the concept. Between the time lag since I actually read it, the fact that in writing this sentence I’ve been interrupted by dogs three times, and the fact that it’s a mystery and I’m loathe to spoil the plot, this review may be a bit disjointed. So, here’s what I loved: Jett is a great narrator POV. She has a snarky inner monologue that really appealed to me – that combination of observational skills and dry wit is one I especially appreciate, and her comments, largely unspoken, inject much needed humor – even if it’s sometimes gallows humor – to what would otherwise be a grim story. Sid – Jett’s best friend. I love the setup of that relationship, and the way he’s both protective of her but also challenges her. We all need someone like that in our lives. KitKat – the deceased. How can you not love a woman you only meet in flashbacks and through other people’s experiences? She seems like the slightly eccentric person we all know, and secretly want to be, maybe, a little. I love that she was the epicenter of her found community and chosen family. 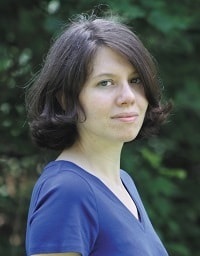 Author Libby Cudmore has a fresh voice that spans the Gen-X and Millenial generations. She’s got the knack for writing the voices of modern hipsters with their love of all things retro (care to buy an album on vinyl, anyone?) but she also lends perspective that isn’t limited to one generation, one culture, even one person. Her dialogue is always believable. Early in the novel, in the wake/apartment-cleaning party where everyone is picking through KitKat’s belongings, she spotlights several different people – Natalie, Mac, Hilary – and they all have distinct voices. I felt like I was sitting in a chair in the corner, hearing all the bits of dialogue. That’s how realistic her writing is. The mystery plot and the mix-tape that’s mentioned one the first page are both nostalgic (somewhere I have a box of Maxtel tapes. I liked the 90-minute-long translucent ones with the pink and orange highlights) but also completely contemporary. Similarly she blends the use of modern technology (the community has a group on Facebook, on the subway people display their dead friend’s picture on iphones), with the gritty reality of face-to-face communications. What results is a mystery that is grounded in human relationships and rounded out with music, art, fashion, and all of the other things that give our lives shape and form. Don’t dismiss this novel as something cheeky and fun. It is that, but it’s also a gripping mystery laced with wry, and sometimes biting, social commentary. Goes well with a latte made with organic milk (soy is 35 cents extra) and fair-trade, single origin espresso, and a vegan brownie. 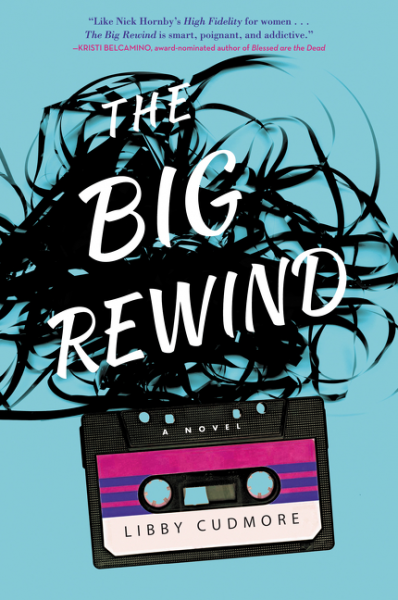 The Big Rewind by Libby Cudmore (@libbycudmore) #review #TLCBookTours by Melissa Bartell is licensed under a Creative Commons Attribution-NonCommercial-ShareAlike 4.0 International License. I think you did a great job with your review in spite of all the interruptions. This sounds like quite a page turner! Thanks for being a part of the tour.